Howard Chandler Christy’s 1940 painting of the signing of the U.S. Constitution, which hangs in the U.S. Capitol. 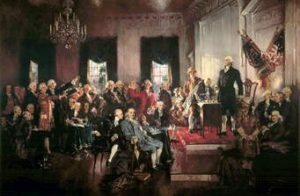 To do precisely that—to abolish a government that disregarded natural rights, and to institute new government that protected those rights—our forefathers fought the Revolutionary War. Declaring independence was one thing; obtaining it, quite another. Even after their upset victory over the mightiest military power on the planet, their work was not complete. Miraculous as it was, the Constitution was, as of September 17, 1787, only a proposal on parchment. Ratification required a hard-fought, close contest. And even then, the work of the founders was not complete. That amendment and the nine that follow—the Bill of Rights—acknowledge and enumerate rights that were then secured for many, but not for all—leaving the work of the founding incomplete. It took the Civil War to test, in President Lincoln’s words at Gettysburg, whether “a new nation, conceived in Liberty, and dedicated to the proposition that all men are created equal … [could] long endure.” Thankfully, it did. Following the Civil War, the 13th Amendment prohibited slavery; the 14th extended equal protection of the law to all; and the 15th ensured the right to vote regardless of race, color, or previous servitude. Even then, the work of the founding was incomplete. It remains incomplete today. The freedoms we enjoy were secured for us by our forefathers at the highest price, but bequeathed to us as gifts. Preserving and extending them is up to us. First, we educate about the history, ideals, and continuing relevance of the American founding. Throughout the school year, we bring students from around the nation to our magnificent 75-acre campus, bordering Valley Forge National Historical Park, for multi-day, immersive instruction. Throughout the summer, we do the same for teachers. Through speaker series, publications, and collaboration with allied organizations, we inform and inspire the broader public. Second: We honor exemplary citizenship. Our awards programs recognize and publicize acts of civic virtue, thus encouraging their emulation. We particularly honor those who risk their own lives to defend others. Our campus hosts the Medal of Honor Grove, a serene woodland where we commemorate by name each recipient of the nation’s highest award for valor in action against an enemy force. Living recipients of the Medal of Honor are deeply involved in the design and delivery of our character education programs. Third, we challenge all to embrace both the rights and the corresponding responsibilities of citizenship. We specifically challenge all to celebrate our shared heritage of freedom, protect individual rights, and defend the Constitution. In that spirit, we challenge you! Make time today to read the Constitution. Then join us in preserving, protecting, and defending it. Sign up for our email updates. And if you can, donate to support our work. As a non-profit, non-partisan, non-sectarian, educational foundation, we pursue our mission through the voluntary contributions of engaged citizens like you. Your tax-deductible contribution of any amount will be gratefully received and put to good use. David Harmer is President and Chief Executive Officer of Freedoms Foundation at Valley Forge.